Located in the Jungle about 45 minutes from San Ignacio, the Barton Creek Cave is one of Belize's most beautiful natural wonders. Explore this stunning sacred cave as your licensed tour guide introduces you to the ancient Maya world. The entire cave is about 10 miles long with approximately one mile accessible. Enjoy an enchanted cruise into the Mayan Underworld known as "Xibalba", and look out for ancient artifacts including sacrificial remains and broken pottery. Learn about the Mayas and their uses of the sacred cave while floating among giant stalagmites under a cathedral like ceiling. 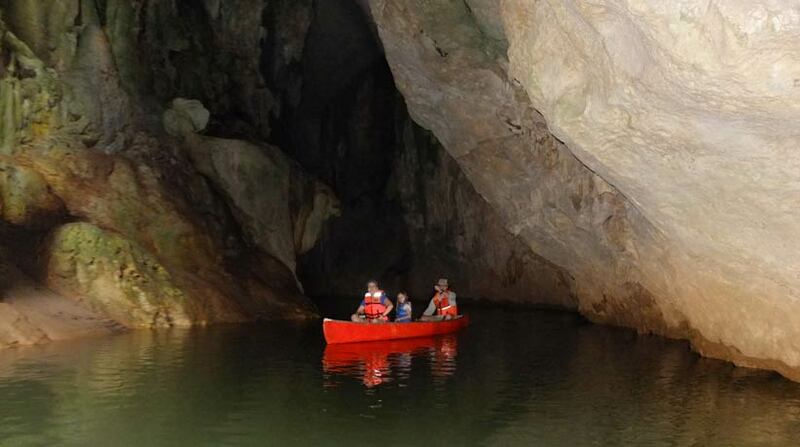 Canoeing through this cave is sure to be the experience of a lifetime. Your licensed guide is trained in Belize History and Mayan Culture, making the trip a fun-filled, informative and unforgettable experience. After the tour, enjoy a refreshing swim at the entrance of the cave, or relax under the jungle canopy with a cool drink. You are advised to bring; water, insect repellent, camera, and a change of clothes in case of swimming. For a Full Day: Barton Creek Cave can be combine with either Xunantunich Mayan Ruins Tour or Mountain Pine Ridge Nature Tour. Tours include: Transportation, Guide, Entrance Fee, Bottle Water, Soda, Tours Equipment. Sign Up for the Barton Creek Cave Tour Today!